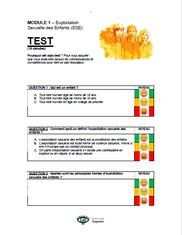 SELF EVALUATION MODULE 1 - CSE - Site de malletteeyt ! 3. Keep this test and bring it to your next meeting with ECPAT. You can then discuss your answers and clarify the elements you wish to clarify.